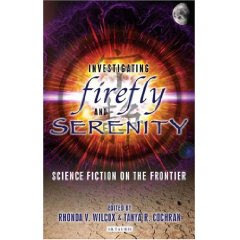 Investigating Firefly and Serenity: Science Fiction on the Frontier. Edited by Rhonda V. Wilcox and Tanya R. Cochran. London and New York: I.B. Tauris, October 2008. Paper: ISBN 978-1845116545, $22.50. 304 pages. “Yes. Yes, this a fertile land, and we will thrive” (Serenity 1.1). This line from the first episode of the short-lived television series Firefly (2002-2003) opens this review, as this anthology demonstrates the scope of scholarly discourse on both the television series and the movie Serenity (2005). When Wash, the pilot, speaks this line, he plays with plastic dinosaurs on a spaceship dashboard, saying much with few words. Joss Whedon, writer and director, does not play on a ship, but on a soundstage, feeding his lines to beautiful talent. Whedon’s space-western features nine outcasts and heroes just trying to keep flying on the edge of civilization. Carey Meyer designed the 10th character of the show, the Firefly class spaceship called Serenity; just as there are fourteen Firefly episodes, there’s only one Serenity film. Whedon and his gifted crew bring our fond ambitions and fraught anxieties to life in a post-apocalyptic future wherein alien planets are rendered suitable for human habitation by mining, farming, terra-forming and civil war. While much changes in the next 500 years, people are still human. Well, most of them are: some of them might be monsters! In any case, “Earth That Was” is just a history lesson for the kids, a creation myth of dubious relevance. “Curse your sudden but inevitable betrayal!” The dinosaurs fight, misled by greed only to be swept aside, their fertile land destroyed by forces beyond their control. Who could have known, when the scene was first shot, of the FOX network betrayal that would cancel the series, loose ends of narrative thread waiting to be woven into the rest of the story? Could anyone have predicted that fan support, from DVD sales to online activism, would be so voluble and vociferous that Universal Studios would help Whedon produce the film? (Serenity: Those Left Behind, a Dark Horse comic published in 2006, bridges narrative gaps between the series and the movie.) The story behind the story calls for further inquiry into this science fiction on the frontier. Given the eclectic academic community that coalesced around Whedon’s most famous series, Buffy the Vampire Slayer, complete with peer-reviewed journal, Slayage, this anthology is inevitable if not altogether sudden. Wilcox and Cochran quote the pilot near the end of the beginning of their book and at the close of their introduction to the special issue of Slayage. For just as the show is one story in two formats, small screen and silver screen, their editorial project yielded two texts. The twenty-fifth issue of Slayage features five articles, while this installment in I. B. Tauris’ Investigating Cult TV series presents nineteen essays. Yet these contributions represent less than 17% of submissions received in response to the call for papers. The integrity of these collections is explained, in part, by the quantity of discussion these shows have inspired among educated viewers. The editors chose writers from diverse disciplines yet generated a coherent whole wherein lines of dialog, images, episodes, and characters are examined from several points of view: theology, ethnomusicology, aesthetics, anthropology, and gender studies, among others. Firefly and Serenity do not come to us ex nihilo. They descend from the Star Trek series, and the 1939 film Stage Coach, both of which were subject to subsequent remakes. These essays reveal meaningful connections between these direct ancestors as well as Plato’s Symposium, Shakespeare’s Tempest, Orwell’s Citizen Kane, and Sartre’s Nausea, to cite but a few more distant relations. The word “reveal” is important. People like stories with pretty girls, scary monsters and explosions. Firefly and Serenity have gorgeous girls, terrifying monsters and awesome explosions—enough said? Yet the writers in this collection are not so much piling it on as peeling it back, exposing layers of meaning and depth. They challenge questionable elements of the show including legalized prostitution, racialized villainy, and summary execution. Since no one who reads this volume will have expertise in all of the disciplines, everyone will have to look something up. Perhaps future editions could follow the lead of Cricket magazine for children, wherein vocabulary is defined as marginalia. What would be lost in convenience at the press would be gained in accessibility. Reader effort is rewarded: The code-switching of the characters between English and Chinese is an abrogation of a monolingual form of discourse (Mandala 38). When “competing but co-existent status systems…arise when independent hierarchies from different cultures interact” tensions are bound to mount between high-class hookers and working-stiff cowboys (Aberdein 70). The inconclusive dichotomy between brute pragmatism and blind faith teaches the value of pluralistic approaches to humanity as, “Meaning is not in things…but between them, in the interplay, the connections, the empty space” (Erickson 179). Mayhem abounds but, “the film is able to dazzle its audience with a beautifully conceived and thrilling space battle…and to provide them with a more intimate struggle as the crew fights on the surface of the planet to reveal the truth” (Abbott 232). The truth? Really? What role could such an old-school notion play in this postmodern post-mortem of a polysemic post-colonial pastiche? Why, the premise of the show is “nine people looking into the blackness of space and seeing nine different things” (Whedon quoted on 168). Well, maybe the truth is not out there; it’s just a plot device, a cheap plastic toy that’s swept away when the complex danger of the real world bears down upon us. But perhaps, “Firefly is effective because it uses science fiction without losing sight of the human and embodied concerns that are unlikely to be swept away by technology, even if we become more scientifically advanced and cyborg as a species” (Bussolini 140). Maybe the truth is not something we assign to any one view but something relational that emerges from the intimate struggle between people “who trust each other, who do for each other and ain’t always lookin’ for the advantage” (“Our Mrs. Reynolds,” 1.6; quoted on 59). Neither the characters nor the critics see the same things—but that’s an asset, not a liability, for our ability to thrive may depend more on how we do for each other than whether we are right or come out ahead. To investigate Firefly and Serenity closely is to see many things in this fertile future myth of resonant relevance.